Abstract: At about the size of a pack of Wrigley's, this solid state storage device comes in a range of sizes, with 128MB or 256MB being the most popular. When it comes to carrying data between computers, the computing world has come a long way from the venerable 1.44MB floppy drive. First there were Superdisks, then Zip drives, then Jazz, and CD-RW's. Nowadays, we have solid state, high speed, and nearly indestructible memory that fits neatly into the smallest of pockets, and requires nothing more than a free USB port. 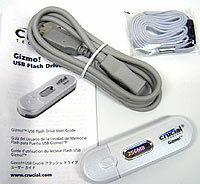 USB hard drives as they are commonly called, are essentially memory on a stick. At about the size of a pack of Wrigley's, these solid state storage devices come in a range of sizes, with 128MB or 256MB versions being the most popular. So long as your PC is running Windows2000 or higher, you will need no drivers, and installation will only take but a second before you can access and transfer files to and from the USB hard drive as you would any other such device. 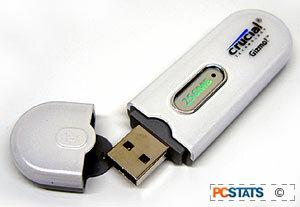 If your computer is running Win98/98SE, there are drivers at Crucial.com you can download to get the Gizmo up and operational. Drivers are not included in the package however. In the editorial world, when you are faced with carrying around a pack of Zip discs, or one little USB hard drive, the choice is obvious. USB hard drives, like the Crucial Gizmo, simply hold more data, are smaller and more robust, and offer better compatibility. Short of lugging around a laptop with CDRW burner, a USB hard drive of 256MB size is the next best thing when you need to move large amounts of information, and can't worry about there not being the right kind of drive where you need to go. USB ports are everywhere, and that makes the Crucial USB hard drive about as universal as the floppy disk it has long since replaced. Sure there are solid state flash media standards that can store the same amount of data, but not every PC has a SmartMedia, Memory Stick, or Compact Flash port, and as these media were originally intended for digital cameras and like devices, they aren't always the most robust.